New law could pose challenges of cost escalation, increased paperwork, fear developers. Reeling from a slowdown in sales and a delivery crunch, the real estate sector is in for a double whammy with the Real Estate (Regulation and Development) Act, 2016, or RERA, feel developers. Under the Act, cleared by Parliament in March, real estate companies, perceived to be a non-transparent lot, would have to submit a slew of details to a proposed regulator. Violations are likely to attract stringent penalties, which are scaring company owners and even prompting directors on their boards to quit. From small property dealers to board directors of realty firms -- all can face punishments under the provisions of RERA. Players in the sector feel threats are manifold. Smaller builders said they fear some clauses in the Act threaten to wipe out their very existence. There are also fears of cost escalation as clearances could take longer than usual. “It will be difficult to adapt for every developer, broker and even buyer. RERA would make business difficult for us,” said R K Arora, chairman, Supertech. The company has been taken to court by buyers for alleged non-delivery of flats. Arora added paperwork would also increase for developers. “But for the sector, this is the way forward,” he said. Working on multiple projects would also be a challenge as the proposed regulator would seek details of previous projects before sanctioning new ones, according to the Act. With the number of non-delivered apartments piling up, companies would need to clear the backlog before launching new projects. In the National Capital Region itself, delivery of an estimated 159 million sq ft of projects was delayed by two years, said research firm Liases Foras in May this year. Another 164 million sq ft were late by 12 to 23 months. Developers were also worried about details they would have to submit to the regulator. Apart from the details of the promoters of the companies, they would have to provide details of current and previous projects, and their status, with reasons if they were pending. Details of pending legal cases would also have to be shared with the authority. Builders fear all this would escalate costs. One of the biggest hurdles will be that builders have to put 70 per cent of sales receipts from customers in an escrow account, against the backdrop of many developers diverting funds as they are unable to complete projects. “We need to keep funds in an escrow account. As we won’t have access to those funds, we would need to borrow from banks. With a lot of court verdicts and regulations, we are seeing ‘stress of doing business’ rather than ‘ease of doing business’,” said Deepak Goradia, managing director, Dosti Realty. Based on the model Act the Centre had framed, state governments were framing rules. They would also soon constitute regulatory authorities. As a result, business models might have to changed, if developers expect to survive. “This may require extra time and effort from the developers,” said Samatak Das, chief economist and national director, research, Knight Frank India. However, what is getting them most jittery are the strict norms that would make surviving difficult. “Developers will be able to launch project only when they have all approvals. This will imply longer timeline for launches and reduced launches,” said Ankur Dhawan, chief business officer, PropTiger. Smaller players, who work with 500 sqm or a little more space, would have a hard time clearing all the clauses of the Act, experts said. They believe many might have to shut shop. Property dealers or brokers, who in most cases just show properties, have to be cautious, too. Brokers can only market projects for which they are registered and will have to refrain from over-promising on behalf of the builder, according to the rulebook. Online realty players might also be brought under the ambit of RERA, experts said. There was, however, a silver lining on the horizon. With stringent rules, RERA had brought the focus back on deliveries. Developers were now focusing only on completing projects and selling units. Also, all the projects without completion certificate on the date the legislation became active in a state would have to register with RERA. Hence, developers were in a hurry to complete delayed projects, trying to avoid being brought under the ambit of the Act. Image: A file photograph of an under-construction residential building in Kolkata. Photograph: Rupak De Chowdhuri/Reuters. 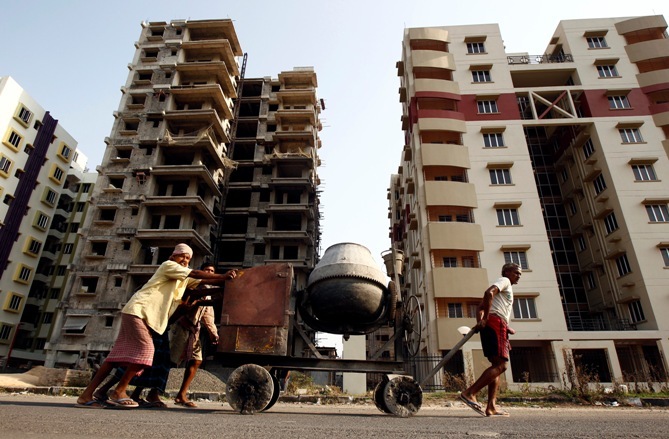 Can real estate in India recover from its slump? Will the new Real Estate Act be a game changer?